Home Amazing Abandoned Ship Has Been Roaming the Arctic Waters for 38 Years! Abandoned Ship Has Been Roaming the Arctic Waters for 38 Years! The SS Baychimo, a 1,322-ton, 230-foot long cargo ship launched in 1914 was was built at the Lindholmens shipyard in Gothenburg, Sweden. It was originally called the Ångermanelfven. It was used for trade between Hamburg and Sweden until 1914. In 1921, the cargo ship was one of the many ships transferred to Great Britain as part of Germany's reparations for shipping losses during WWI. It was renamed “Baychimo” and was mainly used for trading back and forth along the coast of Canada. In 1924 the ship circumnavigated the globe and continued carrying supplies until 1931 when the crew found itself trapped in an early season icepack at the end of a trade run. The men hiked for about half a mile over the ice to Barrow, Alaska and waited there a few days for the ice to break up so they could continue on to the next post. A week later the ship was trapped again. Most of the crew was airlifted to safety. A few remained behind to keep watch over the ship. Baychimo was only a half-mile offshore so they stayed in a hastily constructed shack fully expecting to remain there for the duration of winter. On Nov. 24, the temperature rose dramatically, from minus 60 to zero and a blizzard raged for three days. No man dared venture out of his shack. When the storm abated, the ship was nowhere to be seen. Only a pressure ridge of ice remained where she had been. The men presumed her to have sunk. A few days later, an Inuit seal hunter saw the ship floating about 45 miles away. When the ship’s captain, Sydney Cornwell, found her, he decided that although still intact, the ship was no longer seaworthy. So he unnloaded the cargo and other valuables and left the ship. The Baychimo, however, proved to be more than seaworthy. A few months later she was found 250 miles to the east. A year later, Leslie Melvin, who was traveling with his dog sled team near Nome, reported seeing the Baychimo floating near shore as if waiting for her crew to re-board. Some more months later prospectors also reported a sighting of the crewless cargo ship. In 1932 a trading party attempted to board the ship near Wainwright, Alaska and a year later an assemblage of Eskimos boarded and was trapped for ten days due to an unexpected storm. A few months later, the Hudson Bay Company received report that the ship was still afloat but decided the ship was too far out to sea for salvage operations. The nest year, another group of explorers attempted to board the ship again but returned to their schooner. A year later, another sighting was reported off the northwest coast of Alaska. 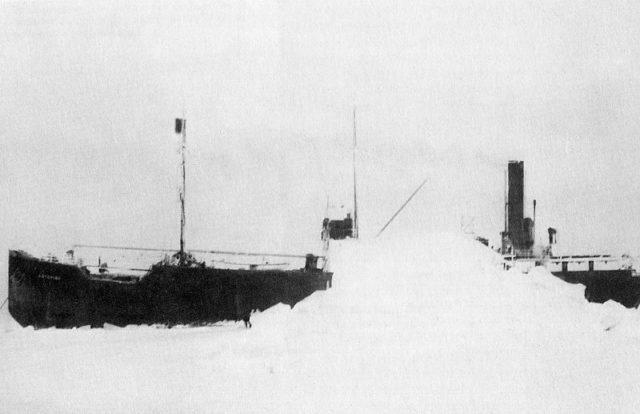 In 1935 Captain Hugh Polson attempted to salvage the Baychimo but was unable to do so due to ice. Several other sightings were reported over the years including one in 1962. In 1969 she was seen for the last time stuck in an ice pack off the Alaskan coast in the Chukchi Sea. Ten years ago, the Alaskan government launched a project to find the Baychimo searching both above and below the sea but at this writing, the “Ghost Ship of the Arctic” is still eluding capture.